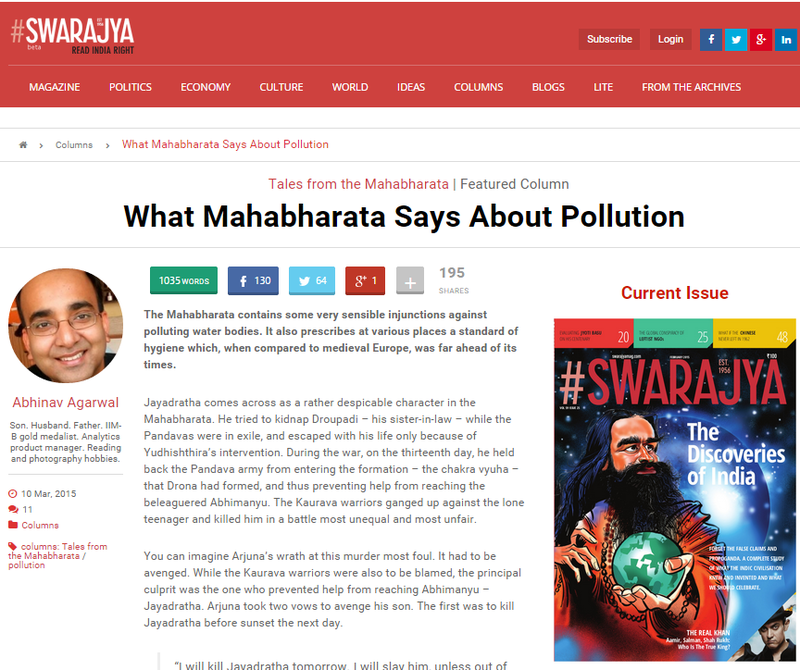 My post on what the Mahabharata says on pollution appeared in Swarajya Magazine on March 10, 2015. Jayadratha comes across as a rather despicable character in the Mahabharata. He tried to kidnap Droupadi - his sister-in-law - while the Pandavas were in exile, and escaped with his life only because of Yudhishthira's intervention. During the war, on the thirteenth day, he held back the Pandava army from entering the formation - the chakra vyuha - that Drona had formed, and thus preventing help from reaching the beleaguered Abhimanyu. The Kaurava warriors ganged up against the lone teenager and killed him in a battle most unequal and most unfair. You can imagine Arjuna's wrath at this murder most foul. It had to be avenged. While the Kaurava warriors were also to be blamed, the principal culprit was the one who prevented help from reaching Abhimanyu - Jayadratha. Arjuna took two vows to avenge his son. The first was to kill Jayadratha before sunset the next day. In case you missed the import of what Arjuna uttered in the last paragraph, let me intervene - the worst kind of hell and after-life that Arjuna could imagine was meant for people who polluted rivers and water bodies by releasing "phelgm, excreta and urine" in them. In summary, the Mahabharata cautions against performing these ablutions near one's house, near habitation, near a village, in water, in a water body, along roads - where people would travel, and also advises that people wash their feet before returning. These are sensible pieces of advice that would not be out of place in any twenty-first century manual of personal hygiene. The trigger for this post was two-fold. First, for a country where rivers have been venerated as goddesses (or gods, but that is comparatively rarer), the levels of pollution in our rivers is alarming. The Ganga river sustains a population in excess of a quarter billion, yet is one of the most polluted rivers in the world. Leaving aside the larger economic and policy reasons for the pollution, what does our most venerated and celebrated epic have to say on the topic of pollution? The second was an article in a US newspaper written by one of its reporters that sought to pin the blame for India's poor sanitation on Hindu texts. Of course, it did not directly say so; rather, the article's style was a distressingly familiar miasma of innuendo and sly comparisons with plausible deniability. The first number in the reference is the Parva. So "7" is Drona Parva, while "13" is "Anushasan Parva". The second number is the chapter number within the parva. The third number, a Roman numeral, is the book number in the ten-series volume brought out by Dr. Bibek Debroy, which is an unabridged translation of the Critical Edition of the Mahabharata, and published by Penguin. http://www.raucousroyals.com/lookandlearn/LouisXIV.htm, accessed March 10, 2015.
 http://www.todayifoundout.com/index.php/2011/05/why-bathing-was-uncommon-in-medieval-europe/, accessed March 10, 2015.
 https://en.wikipedia.org/wiki/Black_Death, accessed March 10, 2015. Disclaimer: views expressed are personal.